Birch Essential Oil, Adirondack is believed to be the only authentic birch oil produced on the market today. Quite a bit more complex than the typical commercial "birch oil" on the market. The quality of this oil is quite amazing. True birch oil is expensive because the bark has to be macerated and soaked in warm water for 10-12 hours minimum before it can be distilled. The yield is very low and the oil is more difficult technically to collect from the distillation because its more dense than water and so the oil layer sinks to the bottom of the collection apparatus instead of floating on top like most essential oils. Its aroma is sweet, spicy and minty, a wintergreen chewing gum odor. A powerful oil which could irritate sensitive skin. Has an invigorating, even rousing effect on the spirits. The health benefits of Birch Essential Oil can be attributed to its properties like tonic, disinfectant, stimulant & antidepressant, analgesic, detoxifying, anti rheumatic and anti arthritic, diuretic, anti septic, astringent, febrifuge, germicide and insecticide, depurative etc. Its health benefits are extremely similar to wintergreen essential oil, and a therapeutic quality of wintergreen is extremely hard to find. There are two types of Birch, the White Birch or the Silver Birch which is scientifically known as Betula Pendula (previously known as Betula Alba), and the Black Birch or Sweet Birch or the Cherry Birch whose scientific name is Betula Lenta. The main constituents of Birch Oil are Salicylic Acid, Methyl Salicylate, Betulene and Betulenol. Birch comes under the category of deciduous trees and has been in use as a decorative tree as well as in medicines. * Anti Depressant & Stimulant: Birch Oil is stimulant by nature. It stimulates nervous system, circulatory system, digestive system and the excretory system. It also stimulates the endocrinal glands resulting in more secretions of enzymes and hormones etc. This can play a beneficial role in diseases associated with improper secretion of hormones such as, diabetes, where the enhanced insulin production will help lower the blood sugar level. * Analgesic & Anti Spasmodic: It is helpful in reducing pains of joints, muscles, headache, toothache etc. It is also anti spasmodic and relieves cramps. * Anti Septic & Disinfectant: These are the two of the most important properties of Birch Oil. The components responsible for these properties are Salicylic Acid and Methyl Salicylate, two well known germicides and bactericides in the world of medicines. They protect the skin from bacterial and fungal infections. * Anti Rheumatic & Anti Arthritic: Since it stimulates circulatory system and improves circulation, it is very helpful in giving relief in diseases associated with improper circulation such as edema (swelling), rheumatism, arthritis etc. The detoxifier property of Birch oil also aids in this, as it removes toxins from the body which are the root causes of these circulatory diseases. * Astringent & Tonic: For ages, Birch oil has been in use as a skin toner. A regular external application (in low dosages) effectively reduces wrinkles and sagginess of the skin and the muscles. Its astringent property strengthens gums, hair and tightens muscles. Thus it makes you look younger. * Detoxifier & Depurative: Helps remove toxins like uric acid from blood through increased urination and perspiration (being diuretic and stimulant in nature) and thus purifies blood (depurative is an agent that purifies). * Germicide & Insecticide: Birch Oil is an excellent germicide and insecticide, mainly due to presence of Salicylic Acid and Methyl Salicylate in it. These two components are excellent cures for eczema, ring worm and other skin diseases and infections. You might have seen medicinal preparations like lotions and creams for ring worm, eczema etc. containing these two components. So, Birch oil is a natural source of these. * Febrifuge: It helps reduce body temperature during fever by promoting perspiration. This also helps removal of the toxins from the body through sweat during fever, further improving the condition of the patient. * Diuretic: It promotes urination. Betulenol and Betulene are the two components which are responsible for this property. Urination helps a body in many ways. It helps with losing weight, removal of toxins from the body, promotes digestion, cures infections in the urinary system, cleans the kidneys and lowers blood pressure too. Urination also helps prevent formation of the stones in the kidneys. * Other Benefits: Used as a tonic, it gives feeling of strength, warmth and vitality. It is ideal for use in extremely cold climates. 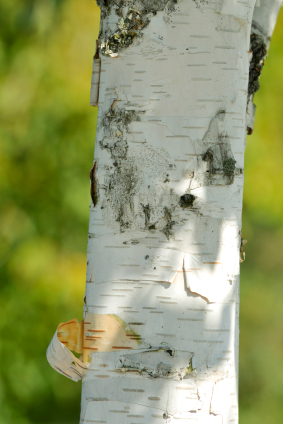 Few Words of Caution: Sweet Birch (Betula Lenta) Oil is toxic and can cause skin irritations. Pregnant ladies should avoid Birch Oil. Dilute 1:1 with a pure carrier oil before applying to skin. Blending: Birch Oil blends well with Benzoin, Sandalwood, Rosemary and Jasmine Oil. Stimulates the sweat glands aiding the body in releasing harmful toxins, can be used as a diuretic for water retention and edema, increases the flow of urine and its diuretic properties could also help with obesity and cellulitis. Useful in a massage for rheumatism and muscle pain since it eliminates accumulation of uric acid in the joints. Also blends well with chamomile, frankincense, lemon and cajeput. It's used as a flavor for gum and toothpaste.